A long time went by without there being any advancement in luggage technology. They didn’t have wheels, they weren’t made of nylon or polycarbonate, and they didn’t expand to fit more stuff than the bag looked like it could hold. Back then, things were made to last, and they did! You could use the same bag for the majority of your life, and luggage that was gifted as a wedding present would stay your luggage for eternity, well, almost. Things aren’t made like that anymore. Now, our bags are made to be disposable, and we spend way more money replacing things that were inexpensive than we would have if we had just bought a nice one to begin with. Early in the 20th century, they didn’t have that option. You either bought quality or you didn’t buy anything at all. I miss those days. I wasn’t alive for them, but I wish things were made to last. 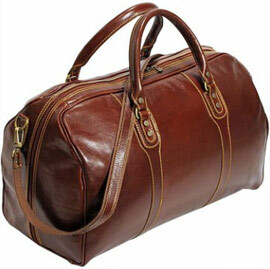 However, I recently came across the Cenzo Duffle Vecchio Brown Italian Leather Travel Bag which is reminiscent of the quality luggage used to offer. It’s not one of the super trendy rolling bags with spinner wheels and logos that send out a “status” message. In fact, it’s a beautiful leather bag that’s nothing short of true class! This duffle is made out of genuine Italian leather, and it can withstand quite a beating without tearing or getting marked. It has tons of room inside because it opens from side to side and all the way down to the base. 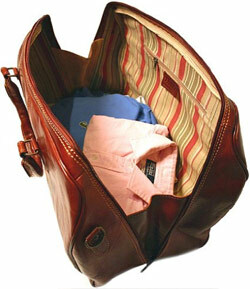 It comes as close to folding flat as it can while still preserving the walls of the bag, so you can fill it with your clothing and not wrinkle your attire. Though it’s roomy and very useful, it can still be used as a carry on for most planes. It should fit nicely into the overhead compartment, and the durable leather is flexible if you have to squeeze it into a tight space. One issue is that the shoulder strap isn’t very substantial, and like most duffles it can be difficult to use when the bag gets heavy. The obvious solution to this would be not to pack those gold bars or several pairs of shoes, but to each his or her own! Oh, and if you think you can still add these “valuable” items without too much fuss, remember this bag doesn’t come with wheels. The zipper on the bag doesn’t exactly meet the craftsmanship of the rest of the product because it’s made of plastic. It still works well and shouldn’t be a problem, but it does take away somewhat from the aesthetically pleasing design of this high-end quality bag. Given the price, this isn’t a bag you’re going to buy, keep in a closet and only use once per year. It’s better for people who travel regularly, whether in the car or on short plane trips. It won’t carry the things you need for several weeks, but it should be enough to get you to and from business or personal trips that take you away from home for a few days at a time. One Bag. I’m in Love. Overall, I’m enamored with this bag. It reminds me of a time that I don’t even remember, when things were made correctly with style in mind. It will last a long time which means it shouldn’t have to be replaced with another piece unless you want something different. I don’t mind spending money on things that are worthy of it. Though it doesn’t have the modern conveniences of a lot of current luggage that have made use of technology, the design (for me) is timeless.